special gifts for those special moments! 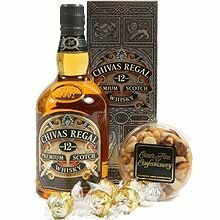 A bottle of scotch and salted nuts - a perfect gift for a man who appreciates a premium Scotch Whisky! Celebrate that special occasion with a shot of Chivas Regal Premium Scotch Whisky. Chivas Regal is aged in American oak casks and is renowned for its smoothness, rich flavour and quality. Compliment the whisky with Lindt chocolate balls and salted mixed nuts for a great celebratory occasion! Comes gift boxed with a personalised card.